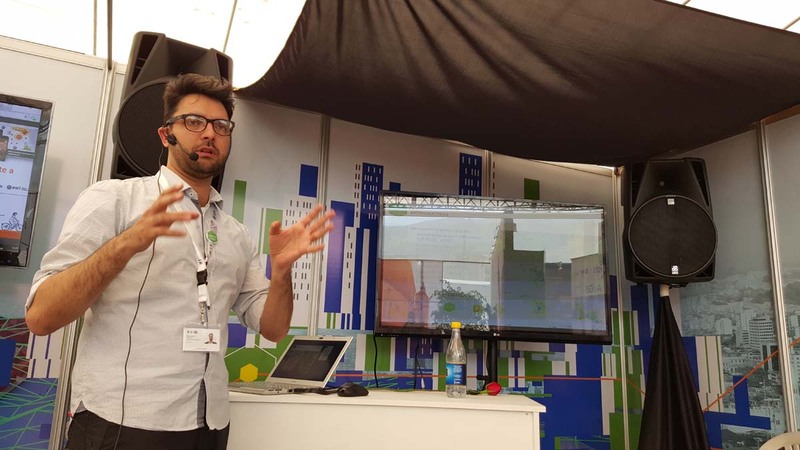 Daily Download 1.0: We’re up and running at Habitat 3! It’s a crisp and clear morning in Quito, and Booth 59 in Section B of the Habitat III exhibition area is up and running. 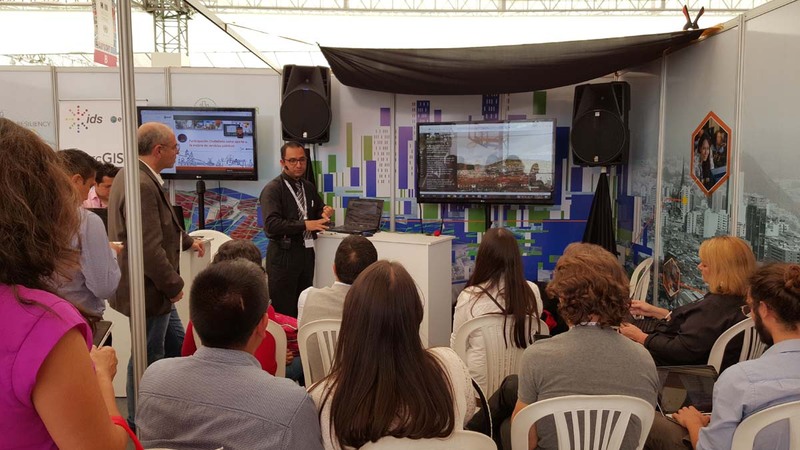 Through a private-public partnership between the US Department of State, Esri, and Ecocity Builders, about a dozen participants at Booth 59 aim to share and discuss their experience harnessing the power of data to create sustainable cities. Carmelle recalls the case of City Sourced, an application for citizens to help government institutions monitor the state of public services. “If there’s a pothole in Main Street, you can tell the municipal government where exactly they should send someone to fix the problem.” It creates collaboration between citizens and government institutions and reduces the cost of monitoring and maintenance. The work of Ecocity Builders (EcB) in Cairo offers a similar example on the importance of participatory mapping. A team formed by EcB and Cairo University took water quality samples at the household level and mapped water flows in specific neighborhoods. After mapping the distribution of water, they were able to identify sources of flooding that damage archeological sites and pinpoint the regions in critical need of water quality improvement. A tool gathered from the bottom helped guide a decision at the top – it’s data by the people, for the people. Over the next four days, Booth 59B will serve as a space for individuals from all walks of life to share their work and thoughts on topics ranging from geodesign in the slums of Caracas to creating climate change resilience through crowdsourcing, from urban metabolism in Medellín, to Porto Alegre’s Sustainable Innovation Zone. With over 40 presentations and about a dozen exhibitors from three partner organizations, it’s bound to be a rich discussion! What’s going on at Booth 59? Using a demo, Carlos shows an enthusiastic crowd how an urban planner would use ArcGIS to understand the impact of a new development, preparing virtually for the future once construction begins. How will the shadow of a soon-to-rise building affect its neighbors to the east at 4pm on August 5th, 2023? Will it block all sunlight reaching the park near the county’s elementary school? How will the proposal affect traffic at different times of the day if the building is residential? What if its purpose is commercial? Should it incentivize the local government to restructure its public transportation network? Carlos zooms out of the block and shows us how his virtual building changes the skyline as seen from different points in the periphery. After clearly visualizing the proposal, urban planners can begin to make some solid decisions. Larry asks his audience, “How to make the best of data to guarantee climate change resilience at the community level? Climate change is a challenge that multiplies the impact of all the other challenges we are facing. There are many gaps in the data on climate change resilience, so we must create that ecosystem, we must expand access to data on social and meteorological factors.” A member of the audience raises a question that shifts the nature of the presentation: “How do you overcome the issue of private data when working abroad on issues of public interest like climate change?” Larry explains that there are private companies like IBM and certain public institutions that have released large datasets, but that overcoming barriers on the open use of proprietary data remains a major challenge. The presentation closes with a series of thought-provoking questions: Should data be treated as a commodity or as public information? Who can afford data of great public interest, and how does this affect global development? How can local governments continue developing their work on GIS-dependent projects if they are requested to release their data free of cost? And finally, how do we tackle these issues at a global level? Santos shows us how to understand the city of Cusco as an organism that uses, processes, and releases materials. Specifically, he focuses on the historic neighborhood of San Pedro to explain the work of Ecocity Builders. After a series of courses hosted by EcB’s local partners on the use of Esri’s GIS programs, the team maps out some of the factors determining the neighborhood’s greatest challenges, among them waste management and access to potable water. From the data-rich, communally collected infographics, the local government and the community can make participatory decisions on how to shape their urban policy and how to strategically expand and optimize the provision of public services. Learning how to develop participatory action research using citizen data. Learn how a neighborhood is changing a once degraded zone into an example of sustainability, business resource efficiency, and better daily life. Explorar como el geodiseño puede servir como platforma de colaboración para desarrollar y mejorar comunidades urbanas y rurales cuidando la naturaleza. Learn about our public-private partnership applying the power of geospatial information to expedite provision of infrastructure services for growing urban populations. Bring your laptop to help map Latacunga, Ecuador in support of the Volcano Disaster Assistance Program, while learning to use OpenStreetMap to support humanitarian initiatives. Learn how to make your community both smart and sustainable.